Kyocera has announced to show a working prototype smartphone with solar charging capability at the Mobile World Congress 2015 next week. This prototype is basically last year’s TORQUE smartphone. 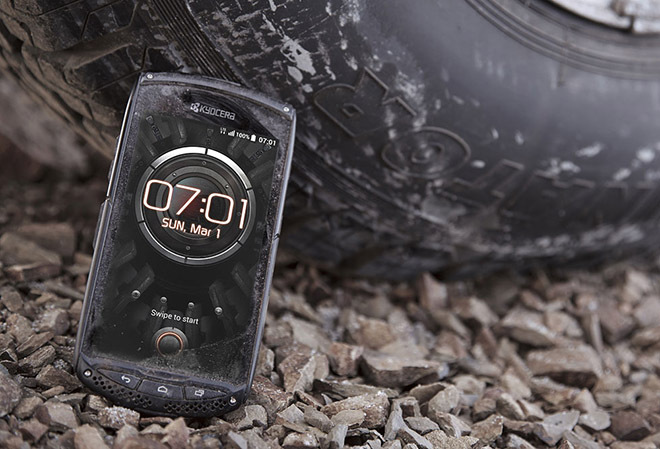 The TORQUE KC-701 smartphone prototype is rugged and design reflects the original TORQUE SKT01 model. Kyocera has used a French company SunPartner Technologies’ Wysips Crystal panel to enable solar charging on the phone. The Wysips Crystal panel combines the optical and photovoltaic technologies into one slim layer to be a part of the entire display panel. If this technology becomes commercially viable, we can expect it to be implemented in few of the premium smartphones in next few years. Considering that the slow pace developments in the mobile battery segment, the solar charging panels could be a viable and practical option along side the wireless charging.